Marshalltown High School senior Cecilia Martinez presented to the board on her experience speaking on a proposed anti-bullying bill at the Feb. 10 press conference held by Gov. Terry Branstad at the State Capitol. A total of 24 students from MHS and Miller Middle School attended the event. 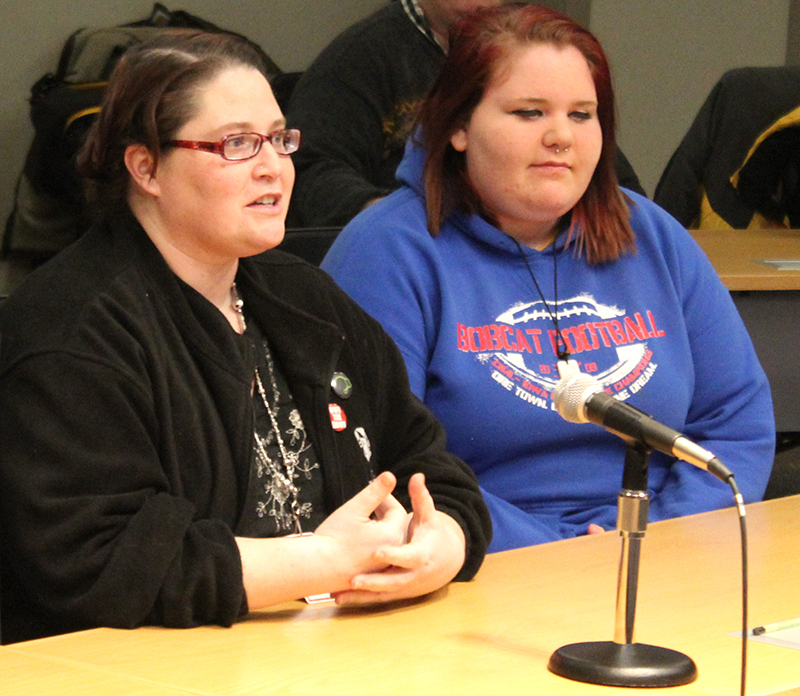 Speech coach Jocelyn Frohwein and student Elizabeth Drennon talk to the school board on Feb. 16. Large group speech coach Jocelyn Frohwein and student Elizabeth Drennon, talked about MHS students who qualified for the recent large group state contest. Group improv and short film made state while radio broadcast excelled at districts. Frohwein said many students on the team are at risk or previously uninvolved students. Frohwein showed a video of their experience and their award-winning short film performance. District administrators Dr. Susan Pecinovsky, Eric Goslinga, Dr. Mick Jurgensen and Jacy Large gave an update to the board on Competency-Based Education. Marshalltown is one of 10 districts in the state involved in the CBE collaborative. The goal is to engage students in the learning process, creating a personalized learning opportunity for students. The focus of CBE is on student learning, not on grades. It’s about advancing through content based on need, not seat time. They said in many ways CBE is already in place in Marshalltown classrooms, with more development expected in the future. Matt Cretsinger presented costs of this program for the next school year through the School Budget Review Committee, which were approved by the board. 902.4 – Releases to News Media – Board Matters – Approved as amended, waive second reading. 902.2 – News Conferences and Interviews (new policy) – Add “may include a representative of the board.” Brand new policy will return for approval. 903.3 – Building visitors – Add that visitors must report to office for badge and bring back. 903.4 – Public Conduct on School Premises. – Change “Conduct Counts” to conduct standards in item No. 4. and bring back. Board meetings are often, of necessity, full of the nuts and bolts of the “business” of running a school district. Tonight’s meeting had us all smiling as we heard – from her own smiling and confident lips – the story of how a speech and drama class has opened up a new world to a formerly withdrawn and uninvolved student. This transformation occurred because a caring coach helped this senior find both her own personal passion and a group of friends who shared it. Hers is a dramatic demonstration of the “personal empowerment” referred to in our district’s Mission Statement. Fisher Elementary Principal Vicki Vopava made a presentation to the board on Feb. 2. 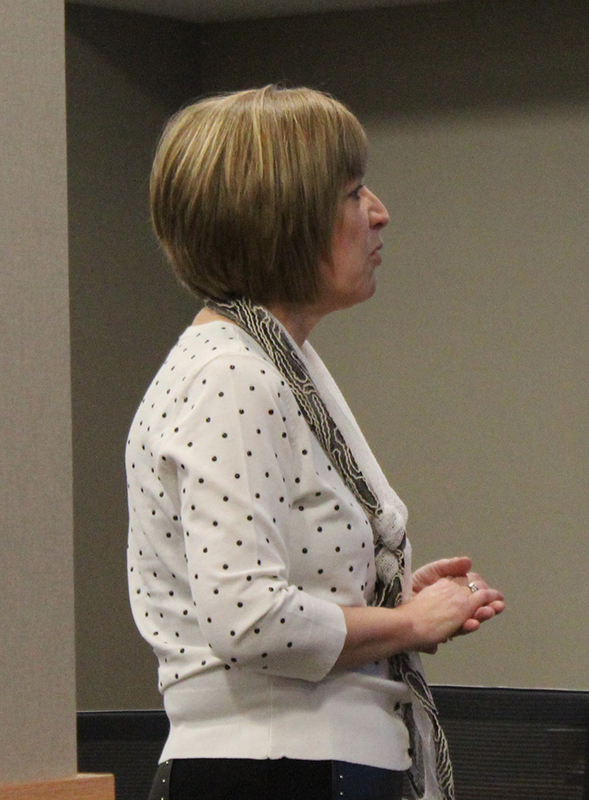 Community member Arlene McAtee spoke to the school board in favor of appointing a study committee to explore the possibility of a Continuous Learning Calendar in Marshalltown Schools. McAtee was joined by several community leaders in support of this move to more year-round learning. She said this would put Marshalltown in a leadership role in this effort. The board approved the request to appoint a committee to explore this initiative. Fisher Elementary Principal Vicki Vopava and literacy coach Jennifer August gave an attendance center update to the board. Vopava said there is a heavy focus on acceleration as it relates to growth in student achievement at Fisher and was excited to share the success they have had. Marshalltown High School junior Beau Ragland spoke about his selection as a Know Your Constitution state finalist. Ragland was among 100 finalists recognized for their work on a quiz and essay on the U.S. Constitution. Dr. Marvin Wade and Dr. Susan Pecinovsky talked about new figures from the Iowa Department of Education, which ranks attendance centers in the state. The two ranking categories released last Friday were student proficiency rates and academic growth. Rankings on other measures are due to be released in the future. To connect to the rankings website, click here. District administrators presented on this strategy to design and deliver curriculum, instruction, assessment and interventions that support the district’s long-term strategic goals and objectives. This strategy is part of the Strategic Action Plan. The board approved the purchase of a Ford F250 truck for $25,184 for the transportation department from Jensen Ford. This new truck will replace some of the work currently being done by a 1984 model truck and a 2001 model truck. The board approved the plans, scope of work and to move forward with the competitive quote process for the remodeling of the Staff Development Annex at 315 Columbus Drive. This remodeling will allow for Reading Recovery training in the facility. The board approved an increase in fees in band uniforms for MHS students. The increase went from $25 to $35 and an increase hasn’t been issued in 16 years for this service, which pays for the dry cleaning of the uniforms. 902.1 – Board – Community Relations – Mark as reviewed with the deletion of first few words. 902.2 – News Conferences and Interviews (New Policy) – Will be brought back for initial reading. 902.3 – Releases to News Media – Internal Unit News – Mark reviewed with deletion of start. 902.4 – Releases to News Media- Board Matters – To come back to board after rewording. 902.5 – Duplicated or Printed Materials – To be brought back to board. For personnel items click here. It was wonderful to learn all of the great things going on at Fisher Elementary School from Vicki Vopava and Jennifer August. It’s wonderful not only to see the numbers of those students displaying accelerated learning, but also to see the excitement of the teachers about that accelerated learning. It’s very encouraging and the results they are getting are exciting. The next regular meeting of the school board is at 5 p.m. Feb. 16 at district offices.